The following information has been gathered from many different sites on the WWW. The Longyou caves in China are really intriguing. 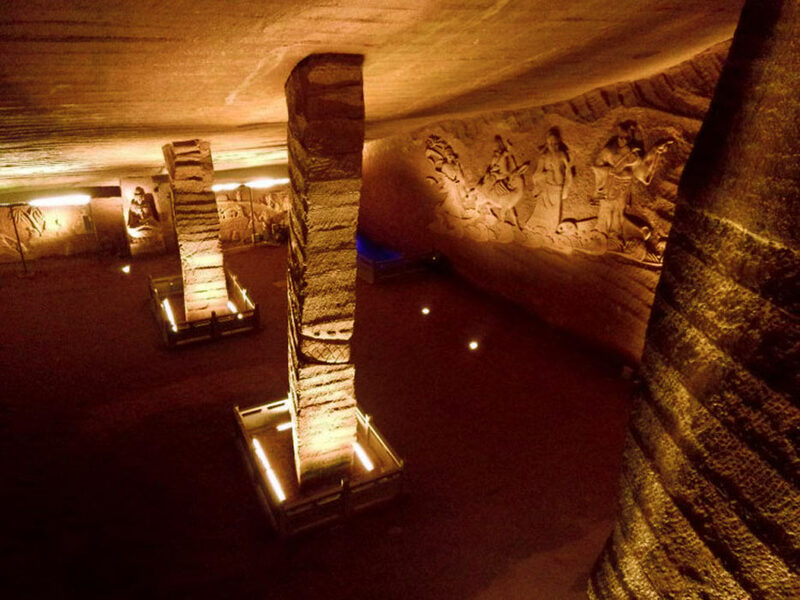 They are a series of large artificial sandstone (argillaceous siltstone of Cretaceous age) caverns located on Phoenix Hill, near the village of Shiyan Beicun (Shiyanbei) on the Qujiang River in Longyou County, Quzhou (Yazhou) prefecture, Zhejiang (Zhejing) province, in Eastern China. The Longyou Caves have been asserted as the ninth miracle in China after the Great Wall and the Tomb of the Emperor of the Qing Dynasty. In spite of this, there is no record at all of this monumental construction, what might indicate that they are very, very old. They are about an hour drive from Jinhua City. Wikipedia gives the coordinates as 29.06157°N 119.18403°E. The caves are located on and around Phoenix hill which is only 69 meters (200 feet) above sea level. The region is a hilly area, next to a river. It was never occupied by people until the 1950’s. By the end of the 1950s, a large flood from the Qujiang river inundated the villages at the foot of the hill, forcing the villagers to move uphill, and thus a new Shiyanbei Village was formed. There they found several water holes they used as a water supplies. The water was of a good quality and inexhaustible. They had tried to measure the depth of the water holes with bamboo sticks but had never found the floor. In June, 1992, a villager named Wu Anai, decided to pump the water out in one of the water holes of the area. Thus, they discovered that it was actually a cave, that was filled with water. The water presumably had been there for a long period of time. It took 17 days of continuous pumping to clear the cave. They found that it was a man made cave. The discovery of this cave encouraged Wu and his companions to pump the water out of another six caves. The caves were all next to each other. They found the caves were generally the same in structure, differing mainly in scale. Each cave had steps that led to the bottom of the cave. Each cave had pillars, ranging from one to four according to the size of the cave. The floor size of the seven caves varied from 300 square meters to 2000 square meters. To date, 24 caves (3 clusters of 8 caves) have been found, one of which is the main tourist attraction. The 24 caves are all within one square kilometers. Apparently there are about fifty to seventy more caves in the larger Longyou area. Today there are five caves open to tourists. Some of the other caves are naturally refilling with water (after pumping) because of water seepage through cracks, and rainfall. The rest of the caves show signs of ceiling collapse, wall collapse, cracks in the walls and pillars, and weathering. If we assume that they were dug all there caves by hand, then this was an enormous project. 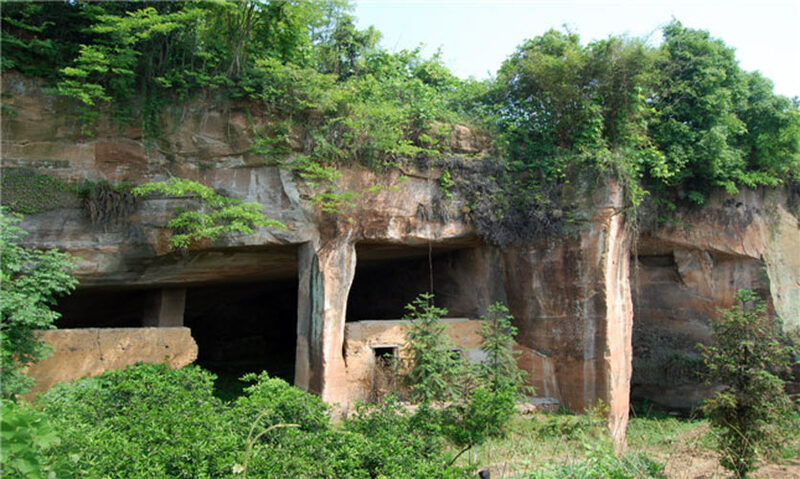 Since a total of 24 such caves have been found on Phoenix hill, the overall excavation would be 900,000 cubic meters. Working 24 hours a day, seven days a week, it would have taken 1000 men 5 years to complete. That is of course a pure mathematical calculation. If only 500 people worked for only half a week and only 8 hours a day, it would have taken 60 years. That is not realistic for just creating caves. And, there are at least 50 more of those caves in the larger area. All those laborers had to be housed and provided with food and amenities, and be paid too. There no traces around the caves of their houses or towns. Also, where did all the excavated rock debris go? At least some 100,000 tons of rocks debris was carried out. No rock debris has been found in the area. If those caves were all dug by hand, then this was an enormous and costly project that could only have been organized and financed by heads of state. But there are no historic records of the Longyou caves, what is surprising because the Chinese were meticulous record keepers. I think we are most probably looking at very ancient caves, when there was a civilization which had advanced technological tools that could cut easily in rock. Shaping stone, and transporting heavy boulders or cut large stone blocks was not a problem for those people, as is evidenced from so many ancient megalithic constructions all over the world. The Longyou caves were dug out in a sophisticated manner, with aesthetics in mind, and with skilled craftsmanship. Interestingly, the caves that suffered structural damage had a horizontal entrance. Some of these caves are also very shallow. Maybe, the caves were fine at the time they were built, and for the purposes intended. However over time, and this might be many thousands of years, they deteriorated due to the surrounding rock which is not of a sufficient hard material. All the caves entrances face South. 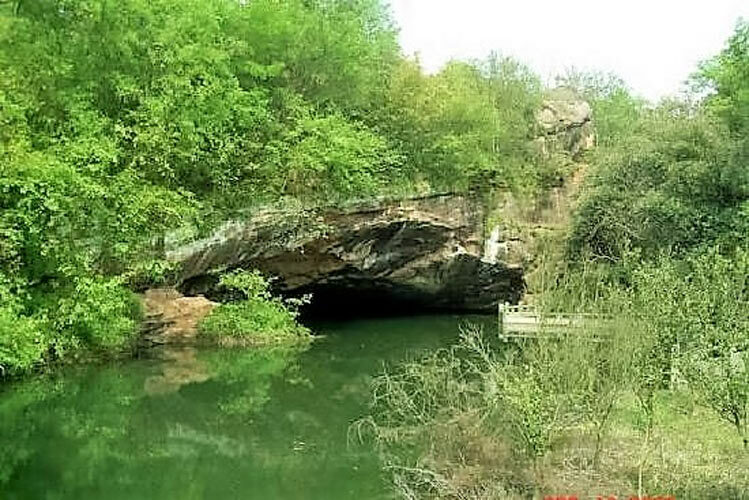 The water holes of the five caves open to tourists, were actually vertical entrances. They are narrow and lead straight down into the caves. The fact that the vertical shaft entrance faces south maximizes the light that enters the cave. Nevertheless little light shines into the interior. How did those people get enough light to excavate and carve the caves in the first place? There are no traces of soot on the ceiling. The following picture shows one of the cave entrances. The following pictures show some of the cave entrances from the inside, and the steps leading down a large hall. The caves are wide and spacey. The height of the caves is between 20 and 40 meters (65 and 131 feet). The total area covered is in excess of 30,000 square meters. Here is another mystery: if you carve a cave, by hand, why make such a high ceiling? That is a lot more work to carve and haul all that rock outside. The caves are next to each other, and the walls in between caves are at some places only 50 cm (about 1 ½ foot) thick! So, one had to know at all times how far one could cut the rock without punching holes to the next cave. One can also raise the question of why all the caves had to be next to each other but separated. Why not just connect them by doorways, for example? When we look at the ceiling, the walls and the pillars, we see that all their surfaces are all finished in the same manner, as a series of parallel bands or grains of two types. One type is long and straight, the other type is short and curved. Officially the parallel bands have been chiseled by hand. Try to imagine how they chiseled parallel bands out of a cave ceiling. They would have to use large scaffolding, and lying on their back all the stone dust would have fallen on their faces, not to mention all over the cave. Difficult work. Why would they do it at all? It is more likely that the bands are the result of a scraping machine. Finer grooves, on the pillar they are in an arc shape. This picture is often found together with pictures of the Longyou caves. But according to this website, it is actually from a Zhejian tunnel. Zhejian is north of Longyou. I have not found any more information about these tunnels. So I don’t know how accurate this is. Interesting is that this tunnel has the same groove pattern on walls and ceiling. This is a sandstone cave discovered at Shetang Village in Lanxi City, East China’s Zhejiang Province. The artificial cavern has a floor area of 3,000 square meters. The purpose of the cave is unknown. Same groove pattern on ceiling. This is an unfinished obelisk at the Aswan quarry in Egypt. Same type of grooves as evidence that the rock was scraped away with some machine tool. Bazda Caves in Turkey. Again horizontal parallel grooves on the walls, result of scraping away rock. Notice also the ceiling has these parallel grooves, just as in the Longyou caves. The following pictures show modern rock scraping machines used for underground mining, or making caves. Notice the similarity in the ceiling grooves. The ceiling of the caves is usually sloped (see above pictures), and in the five caves open to tourists it angles between 17 and 28 degrees. The inclined ceiling design and construction is based on the slope of the bedding strata of the rock layers. This implies an understanding of weight bearing of the rock. The slope used improved the stress condition of the surrounding rock but also reduced the settlement of the roof and the lateral deformation of the sidewalls. A majority of the sidewalls in the five caverns open to tourism are inclined toward their interior spaces. This was done intentionally because inclined sidewalls in caverns are more stable than vertical sidewalls. The advanced engineering knowledge also shows in water drainage. Each completed cavern has a system of surface drainage to collect rainfall and seepage water. The system includes some drainage troughs, some drainage channels, and a water trap. The drainage troughs were carved in the sidewall rocks to guide seepage water to flow down the wall. The water traps were carved in the cavern base rock to collect water in the cavern. There is a wall with figures in the cave #1, the main tourist attraction cave. The other caves don’t have any carvings of scenery. I could not find any explanation of who these figures are or what they represent. From the pictures it is clear that these were made at a much later date than when the caves were created. You can see that the parallel grooves were there first, and later on, somebody cut into it, sculpting the scenery. It is quite common for later cultures who discover underground structures to leave their own mark. We find that, for example, in Egypt in the so-called Serapeum. The figures seem to represent gods and goddesses as they are standing on clouds. One of the pillars had the design of snake or dragon, which is a common symbol for energy. It is quite possible that these caves were dug at spots were there is a high concentration of earth energy, and thus used for initiatory purposes. However, the question about the initial purpose of these caves still remains elusive. Why put so much work in creating these caves? Why are they so large and high? Why was it necessary to carve the entire surface of walls, ceiling and pillars in parallel bands? For the moment, there is no explanation as to why these caves were built, or what purpose they might had. All the classical explanation for building caves, such as for shelter, storage, mining, etc. do not fit with the design of the caves.